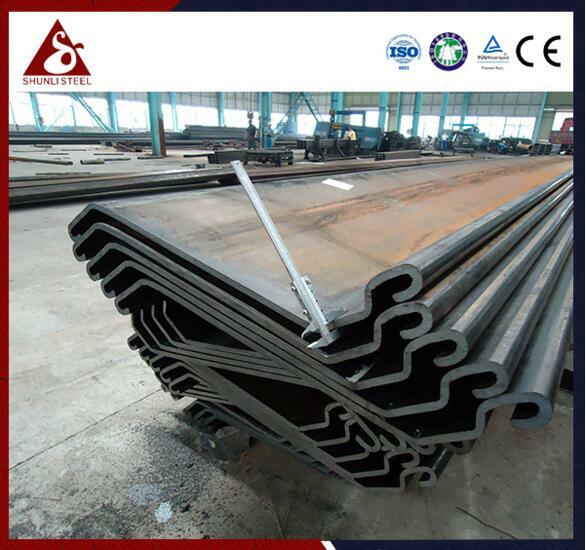 Steel sheet piles are suitable for use in underground storage rooms, hydraulic shock waves to avoid the application of the method to play some serious damage to the underground pipes, the structure of the facilities before, in order to identify the case, the soil hammered. Before playing the facility, we had to measure a mountain that supports the center line. In view of the easy application of the inclined Sheet piles in the side of the long sheet piles, it is not easy to modify the accumulation of tilt error, which is difficult to control the flatness of the steel Sheet piles wall can be used to drive the type of steel Sheet piles wall . (1) Sheet piles, concrete box culvert The foundation construction is left in the mold so that the most prominent basis is removed in the form of the outer edge of the room. (2) rust-proof lock connected by the root, remove the overlapping steel Sheet piles inspection before the failure of steel Sheet piles, serious deformation and pruning before use. (3) While maintaining the layout of the sheet piles, and in order to avoid irregular corners, should be in a straight line shape, you can use the standard Sheet piles and support the setting. (4) prohibitions on cutting, lifting, reinforcement, such as concrete placement, during construction, non-conflict assistance, any dismantling support, support for any support to the quality of the weld should not rest .